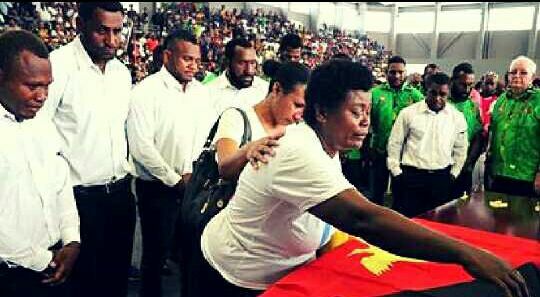 A trust fund has been set up by the PNG Rugby Football League to fulfil Kato Ottio’s dream of building a house for his mother. Before officially handing over the body to Ottio’s family at the funeral service held today, Chairman of the PNGRFL, Sandis Tsaka, said the Kato Ottio Trust Fund was opened yesterday. He said Ottio had always dreamt of building a house for his mother, Joyce, and the PNGRFL wanted to make this dream come true in honour of the late SP Hunters and PNG LNG Kumuls star. Tsaka welcomed contributions from the general public who wish to assist by depositing money into the Trust Fund. He said the account will be closed next Thursday, January 18, at 12pm.